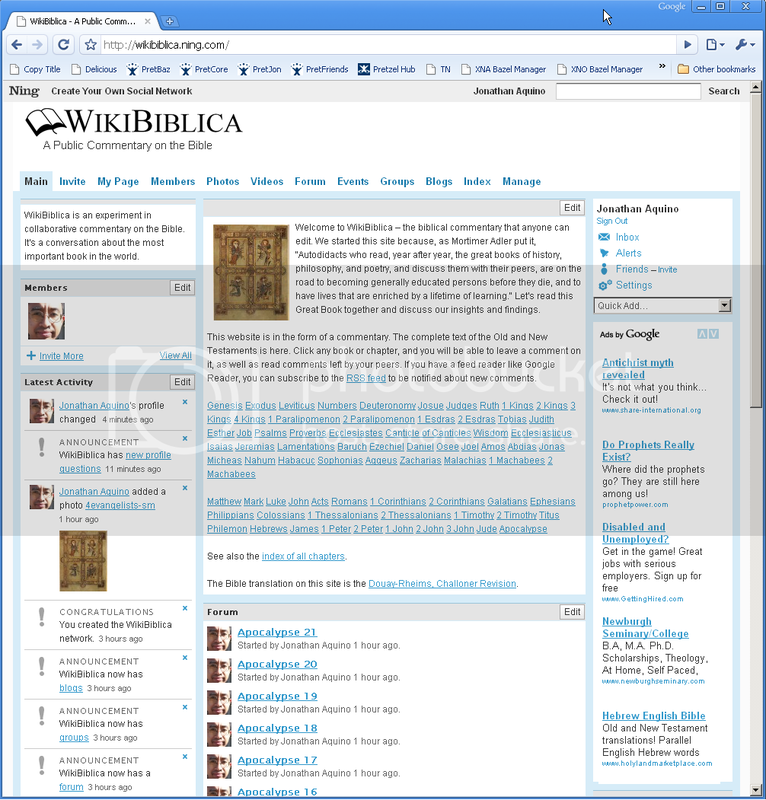 I have created a social network called WikiBiblica, which lets anyone add commentary to the full text of the Old and New Testaments. As far as I can tell, this is the first biblical commentary that is open to contributions from the public. Anyone is free to add comments to any of the 73 books and 1332 chapters. It will be interesting to see the conversations that develop over time and space. posted by Jonathan at 2/22/2009 12:14:00 a.m.
One question though, have you populated everything manually? O have you imported the content somehow? By Fabricio, at 2/25/2009 4:32 a.m.
Hi Fabricio - I wrote a script to post everything. Actually I also had a helper script on the server-side, but I might have been able to avoid that using the regular URLs. By Jonathan, at 2/25/2009 9:01 p.m. But it is good to know that you can achieve it with regular POST as well, I am assuming you need the authentication, so this POSTs would need to be made from the browser after sign in (by a firefox extension or something like that) not from a separated script living on other domain, right? By Fabricio, at 2/26/2009 6:30 a.m.
Actually I had to copy one of the headers from the browser. Then it worked from the script. By Jonathan, at 2/26/2009 11:23 p.m.